And this time...it's the living room! 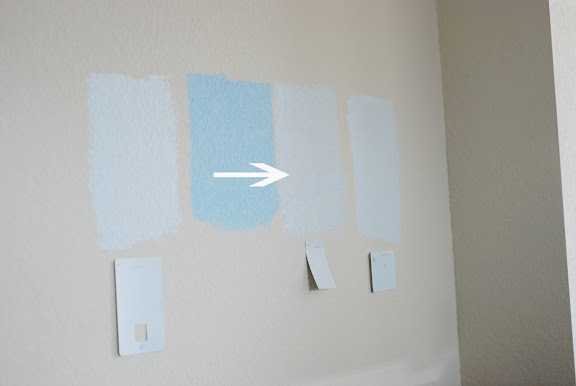 I don't remember if I mentioned this before....but in our last home...we left everything very neutral (similar to the original wall colors here) because we knew we would only be there for a few years. But now with this house...we are planning to stay for a while so we decided to add a little color. To be honest...I am nervous. Just like I was with Grace's nursery....but I ended up loving it. We decided to go with this shade of blue. Not too bright, not too bold, not to blue. The girls and I (me and the girls?...I can never remember the proper grammar for that) are spending the night tonight at my mom's house while Geoff is left alone to do his work! I hope to post pictures tomorrow of the finished paint job! I think it is going to look GREAT!!! Can't wait to see it finished! That is a great color! It will look relaxing!